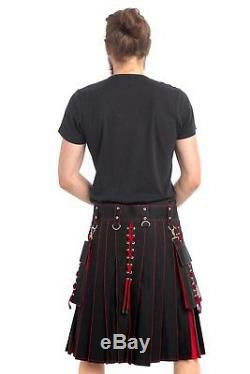 Black and Red Hybrid Kilt. Belt Loops: 2.25 Inches. Button & Hardware: Rust Free. Embroidery: Scottish Lion on Pocket. 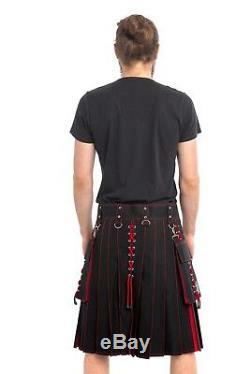 This kilt comes in black with stylish pleats, each accented by a thin outline of red thread. In the front of this kilt are three red x's that match the ones running down the side of the kilt and through the pocket. The detachable pocket is attached to the kilt by an easy-to-undo hook. 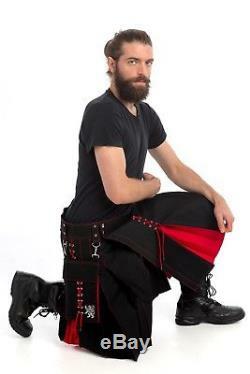 You can customize every part of the kilt, including the main color and accent colors as well as the waist size, fell measurement, buttons and hardware material, an optional hip size and kilt length. Quality policy: Love It or Burn It. The Kilt is synonymous with Celtic pride, and Scottish Kilt is proud to be a leading supplier of kilts for men and women worldwide. Kilts Made the Traditional Way When kilts were first made back in the 16th century, there were no factories or manufacturing plants. Each kilt was made by hand by a tailor specifically for the man or boy who was going to wear it. Great care was taken to ensure that the kilt fit perfectly and was a proud symbol of the wearer's lineage. The first kiltmakers were artists in their own right, but over the years, the art of kiltmaking has been largely lost. Manufacturing has shifted from the tailor shop to the factory with work being done by machines and generic styles being churned out along assembly lines. As a result, the level of quality one can expect from a kilt has sharply declined. Scottish Kilt was founded as a return to the traditional method of quiltmaking. All of our kilts are made by hand by our team of 10 tailors out of the absolute best materials. Like the artisans of the past, we make our kilts to measure to your exact specifications. What We Carry The kilt has evolved over the centuries with many new styles emerging over the years, and at Scottish Kilt, you'll find all of the most popular kilt designs from yesterday and today. We carry classic tartan kilts and wedding kilts for dress wear as well as modern designs like leather kilts, utility kilts and our own innovation--the hybrid kilt. Women's kilts and kilts for children and babies are also available in our extensive collection of kilt designs. Scottish Kilt is your one stop shop for Celtic apparel and accessories. Our collection goes beyond kilts to include sporrans, jackets, shirts, hats, kilt pins, belts, buckles, socks and shoes. We even carry flutes, lyra harps, bagpipes and practice chanters! What We Believe At Scottish Kilt, we believe that there is no substitute for quality and that our customers deserve to be treated to the absolute best shopping experience. That's why we work hard to not just meet your expectations, but to exceed them with the products that we sell and with the service that we provide. We even back up every kilt that we sell with a Love It or Burn It guarantee. To make sure your items fit perfectly when they arrive, we've made some measuring guides with handy tips to help you take accurate measurements first time. WAIST Decide where youd like to wear your kilt. You can wear it up at your natural waist, which is a wee bit above your belly button, and higher than guys tend to wear their pants nowadays. You can also wear your kilt lower, closer to the hips like your jeans or shorts. Its up to you and what you find most comfortable. Having said that, if youre a Gentleman of Substance I generally suggest wearing your kilt higher up. Its much more flattering than having the waistband under your stomach, and the front of the kilt will hang nicely. Take your measuring tape and run it around yourself where you want the top of your kilt to sit. Do pull it just slightly snug. Stand straight and let things fall where they may. No sucking in or pushing out of the gut. HIP Measure loosely around the widest part of your hip. How do you know where the widest part is? Stand with your back to a wall and slowly back up. The bit that touches the wall first is where you want your Trusty Assistant to measure. FELL MEASUREMENT (Distance between Waist and Hip) Run the tape from where you measured your waist to where you measured your hip. The pleats will be sewn down along the fell, which is part of what gives a kilt its unique swish and swing when you move. KILT LENGTH A kilt is worn roughly at the knee. 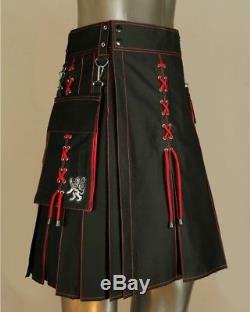 If you like a very traditional look then youll want to have your kilt at the top of your knee. If youre not one for rules and like your kilt to ride low on your hips then you might like to have it at the bottom of your knee. Okay, stand nice and straight and have your Trusty Assistant measure down your side from where you took your waist measurement to the spot on your knee where you want the hem of your kilt to fall. Or you can measure it by bending on your knees and run the tape from Waist to the bottom of the floor. Remember, these measurements are important and need to be accurate. Measure twice, then measure a third time to be sure. If it feels like something isnt right, or if you have any questions, please let me know. Get the all Latest News, Updates and Special Offers about Our Store. Get In Touch With Us. We are trending on Social Media. Follow us and stay updated with our Latest Post, Blogs, Images. 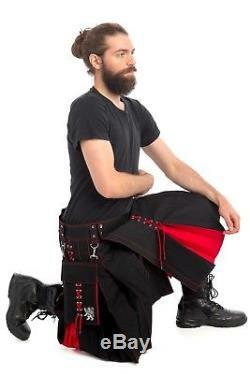 The item "Black and Red Hybrid Utility Kilt by Scottish Kilt Made To Measure" is in sale since Wednesday, February 7, 2018. This item is in the category "Clothing, Shoes & Accessories\World & Traditional Clothing\Europe\Scotland".store" and is located in Brooklyn, NY. This item can be shipped worldwide.